It’s the month to rediscover the delights of colder weather eating with all the wonderful ingredients at our disposal. And where better to find the best food around than at your local Farmer’s Market? I’ve missed the last few markets but will be at Penshurst on Saturday filling my basket with great fish from Arcade Fisheries, venison and duck breasts from Keiron’s Game, wonderful pork and the most marvellous bacon from Spot on Products and hurray, Wild at Heart will be there so I can stock up on their Chilli Jelly! And that’s just for starters…. October 1st sees the start of the pheasant-shooting season but early birds can be expensive so try partridge, grouse, wild duck and rabbit. All are excellent partnered with autumn greens and creamy mashed roots. Mother Nature really is very clever and ensures that the season’s finest ingredients all go so well together! As the nights draw in it’s so good to turn to comfort eating – rich meaty stews and vegetable bakes can be made ahead with the best of the market produce and frozen for later. Why not cook double of your favourite recipes, then freeze and save yourself time ahead? Look out for cheaper lamb and beef cuts that benefit from slow cooking to produce wonderful flavours and melting textures. Partner with earthy partners such as wild mushrooms, kale, squashes and the first really tasty root vegetables of the autumn. Much of our seafood is at its best caught from colder waters so as the sea temperature drops this month, fish just gets better and better. Sea bass, haddock and Dover sole will be fishing well whilst you can find some of the finest seafood caught off the coast of Kent and Sussex at the market. For shellfish lovers mussels are a good choice in October – try stuffed with garlic butter and baked, mopping up juices with market fresh bread and I’ll be cooking them in the Thai curry recipe below. Scallops, prawns, crab, lobster and oysters also make perfect autumn eating. Remember the better the quality of the fish, the simpler the cooking. Smoked fish, especially if done by your fishmonger to his own recipe, is great at this time of year – try hot smoked salmon in a creamy chowder or a winter salad with a soft goat’s cheese, beetroot, toasted walnuts and rocket. Fresh fruit and vegetables are plentiful and very good quality – and winter varieties are even improved by a touch of frost. 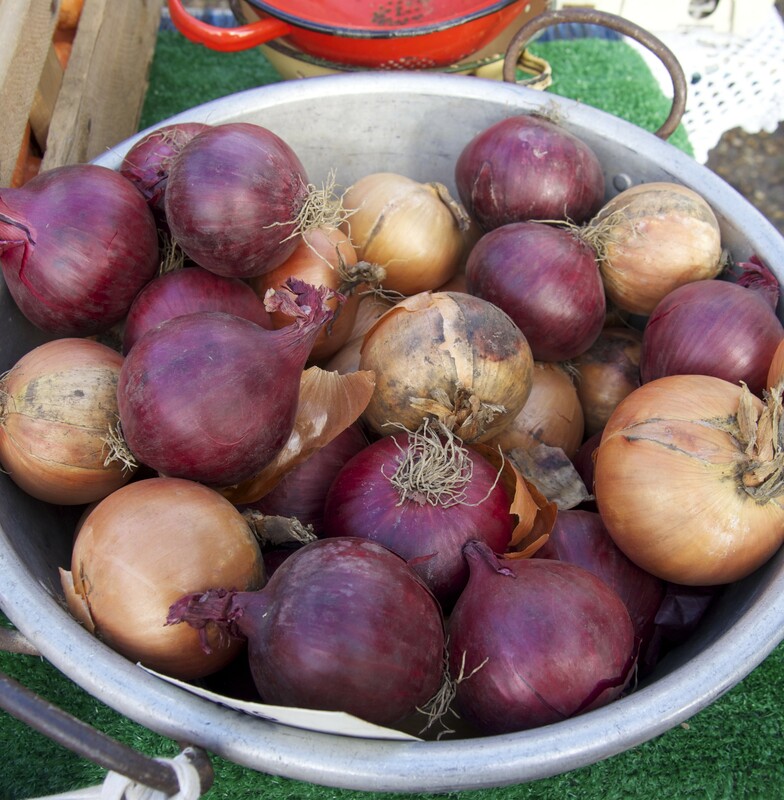 Onions, leeks, beetroot, carrots and tomatoes are all full of flavour at this time of year whilst the wonderful array of squashes and pumpkins offer so much more for the cook than merely lanterns for Halloween. Try them baked with cream and spices or in risottos and curries. Root vegetables such as parsnip, swede and celeriac are all wonderful roasted or mashed and perfect with new season’s game. Use them in soups, stews, bakes and pickles for rich seasonal colour and taste. Cobnuts, walnuts, hazelnuts and chestnuts are all ripening – try them now when they are ‘wet’ and discover a whole new intensity of flavour. Use in autumn salads, toasted with fruit compotes or meringues for impact or twinned with apples and pears in cakes and bakes. Make sure you don’t miss out on all the best local apples and pears this autumn as it looks like being another bumper year, and the hedgerow fruits such as blackberries, sloes, hips and haws are also in abundance so pair with Bramley apples for chutneys, jams and jellies and fill up your larder. Quinces are also more readily available – add to apple recipes, make into jelly (I add star anise for a wonderful jelly to serve with game or pies), or make into pies, crumbles and cakes or try baked with spices and brown sugar. Who needs imported varieties of fruit when we have the best in the world here at home in the Garden of England? And don’t forget damsons and plums with their rich purples and wonderful flavour. 1 Heat the butter in a large pan and add the onion and garlic. Cook over a low heat for 3 – 5 minutes until really soft but not browned. Add the chorizo and cook for a couple of minutes then add the potatoes and stir to coat in the juices for a minute or two. 2 Pour in the milk and bring to the boil. Simmer for 12 -15 minutes until the potatoes almost cooked through. meanwhile cook the sweetcorn in simmering water for 10 minutes until tender. Scrape off the kernels with a knife and add to the chowder. 3 Meanwhile prepare the mussels. Rinse in cold water, discarding any that are cracked or don’t close when tapped to the pan and remove the ‘beards’. 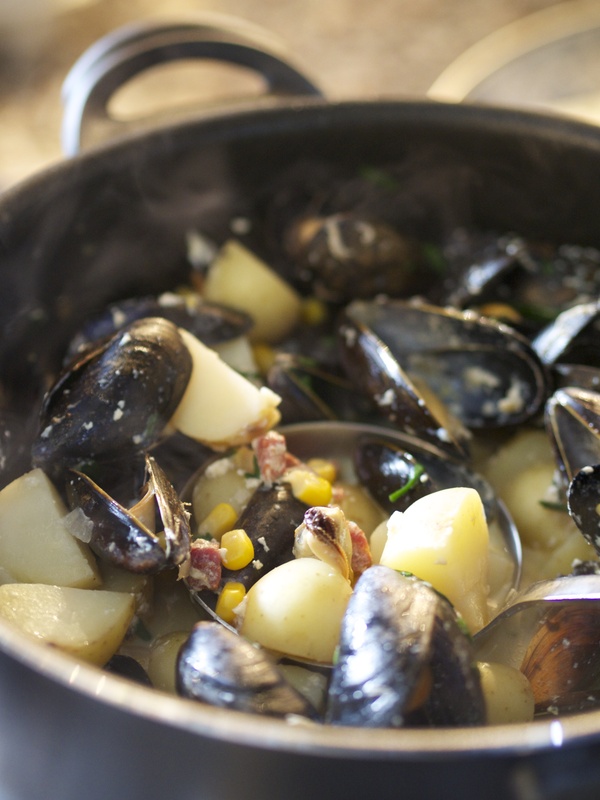 Add to the pan, cover and simmer gently for 4 – 5 minutes, shaking the pan until the mussels open. Discard any that stay closed. Stir in the chives and season to taste. Serve with crusty bread. This entry was posted in Farmers Market, In season, Local food, Recipes and tagged farmers markets, in season, local food, Mussel chowder recipe, mussels, October in season, Penshurst farmers market. Bookmark the permalink.